As much as I love makeup, I make sure its all gone as soon as I reach home after a party or some other event. And I strongly suggest every girl out there to "always" remove makeup before going to bed, if you love your skin. Here's how I remove mine. Clinique Clarifying lotion is available at just4girls for Rs. 1950/-. It is expensive but lasts a long time. You can go for an astringent if you like. Acti white liquid wash was prescribed to me by Dr. Afzal Lodhi. I love this product and use 2 it times daily. You may find it at Time Medicos in Karachi. But if not, you can use your regular face wash.
Calamine powder is available at well known chemists across major cities but make sure you get it from a reliable chemist, as there are similar powders available. If you can't find it, or you're not an oily skin type, just follow step 1 and 2. Cotton balls are widely available at general stores and super marts, everywhere. First, I wet a cotton ball with the clinique clarifying lotion and wipe my entire face with it. It helps remove all that foundation and powders with ease. After that I wash my face with plain water and prepare calamine mask, by mixing a teaspoon of calamine powder with a few drops of water to form a paste and apply. 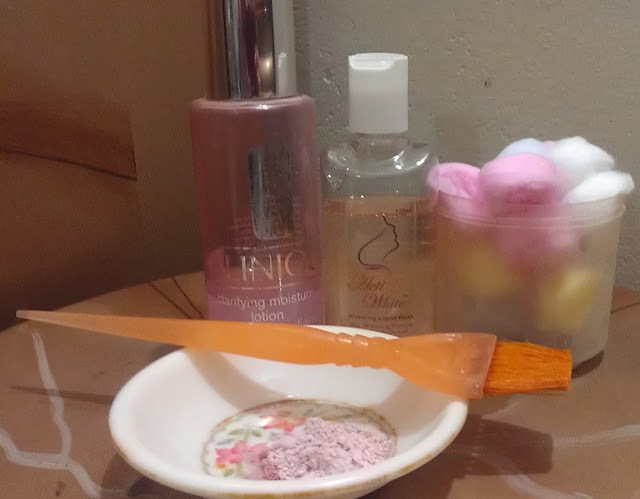 When the mask is dry I wash it off with plain water first and then rewash my face with acti white liquid wash, which makes sure there are no residues on my skin. Tip: Don't pat dry your face with a towel. It increases chances of breakouts and acne. I've given up on this habit and use soft tissues instead. They're a one time use and can be thrown away. All I do is place the tissue on face and gently tap it, so it can absorb the wetness and I'm done. ;) that 's good dear! Please please please stop using the Clinique on your skin - it's far too aggressive - there are so many other toners out there that you could use that would be SO much better for your skin. Sweety clinique clarifying lotion does not hurt my skin as I have very oily skin and the summers here are dreadful. But i'll surely try some others as well :).